Continuous pushing action in one direction provides uniform discharge without pulsation. Displacement for each revolution of the rotor is affected slightly by changes in discharge pressure. All fluids, including highly volatile as well as viscous materials, are handled with minimum turbulence, agitation or pulsation. The unit will pump solids or abrasives suspended in liquids. Even mixtures containing high percentages of solids are handled satisfactorily. Pumping action starts the instant the pump starts. The Pump is built to self-prime at 28 feet of suction lift. The single rotating part exerts a positive pumping action comparable to that of a piston moving through a cylinder of infinite length. Head developed is independent of speed; capacity is approximately proportional to speed. Slippage is a function of viscosity and pressure and is thus predictable for all operating conditions. 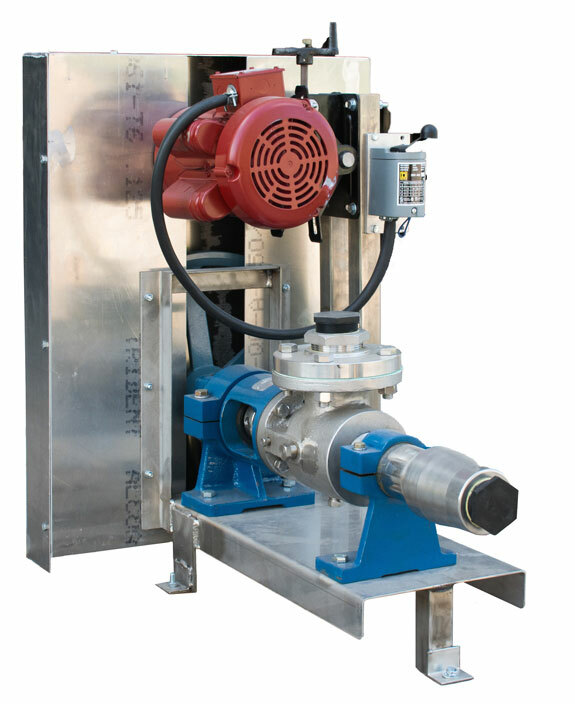 Particles up to 1 1/8 inches in diameter can be handled by the larger Pumps without difficulty. Should a sharp particle become imbedded in the stator, it is passed over and the following fluid tends to flush it free. Cook & Beals, Inc. builds the base for the Pump and equips it with a Variable Speed Pulley on motor, pump pulley, belt, adjustable motor base, and a forward/reverse switch. This arrangement allows the operator to change the speed of the pump to meet the needs of the large or small extracting capacities. The inlet at the top of the pump can be rotated either right or left for installing.